That’s right – HAPPY HUMP DAY everyone! Oh well … I don’t mind cos I must admit, I am absolutely loving my job right now! I spoke to my boss the other day and she has okayed me holding a DIY class on make-your-own Chalk Paint! Yaay! Very excited 🙂 And next week I am going to try making my own Milk Paint! If only finding powder pigments weren’t so hard! Do any of you know where I can find some that won’t cost an arm and a leg?? Not much is happening on the sewing front for me right now. Anyhow, I lent our 2 fold out tables to a friend last week and I took it as an opportunity for a clean up. 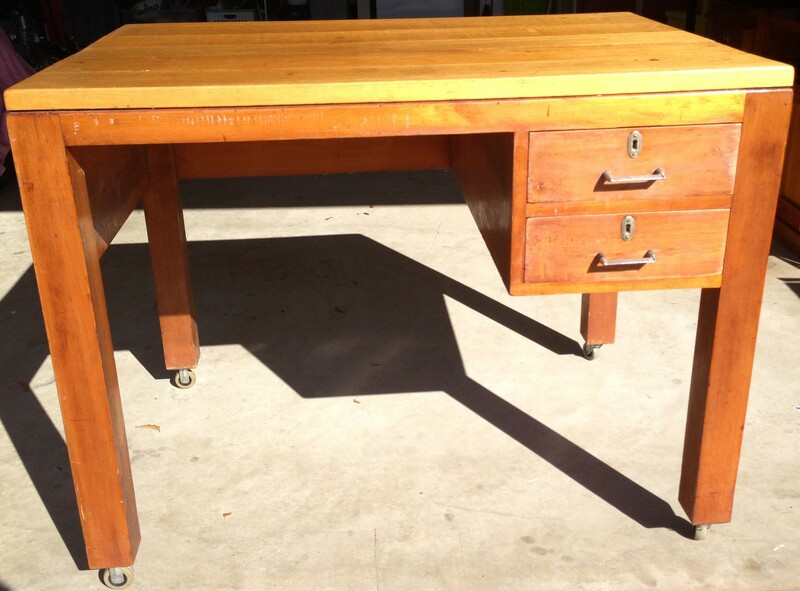 The same day I found this amazing wooden table/desk on Gumtree!! It’s on castors and needs a bit of a tidy up, you might be able to see I’ve already started to sand the drawers? One needed a little repair too and I put them back in to take a quick pic … The yellow/orange varnish has to go! This baby is super sturdy tho! And she fits my cutting mat well. Exactly what I was looking for! Hopefully I will get the make over done including a quick wax today, and get her in and being used by tomorrow! And not before time either! I’m running late on August’s Bee block! September’s is up already and I hope to get them both done before Friday … Speaking of Friday – It’s my little man’s birthday!! I can’t believe he will be 5 already!! He has requested a Minecraft cake and I was pushing for Creeper. He has narrowed it down to Enderman. *phew*! Of alllll the possible Minecraft cakes, this would have to be the easiest! I am starting a detox tomorrow. Not sure what to expect, but I am going to be very strict and stick to it all. Even the nil-caffine rule! Not sure how that one will go! lol Wish me luck! Sew, which Quilt Block are you? I’d love it if you left me a comment to let me know! Well … that’s all I have for today. Will try to squeeze a quick update in early next week – Cya then! ← Excitement to the MAX!! !